Someone’s trash is someone else’s treasure. It’s an old saying, but it remains true today. Even better, your trash can even turn into treasure (or rather, money) for you! Chances are, there’s someone out there who would want to buy the things you’re ready to discard. Whether it’s an individual like you, or a business or manufacturer looking for base materials, you probably have a customer waiting in the wings. With more innovative and sustainable techniques in recycling and reusing, making the most out of different kinds of rubbish is more possible than ever. Aside from keeping your place clean and free from pests, you can also see waste disposal as an opportunity to add more filling to your wallet. Capitalising on the remaining, if minimal, utility of your rubbish is an easy way to make money. There’s no need to add extra capital or money to the practice. All you need is time, effort, and a bit of resourcefulness to turn your rubbish into a small income-generating project. 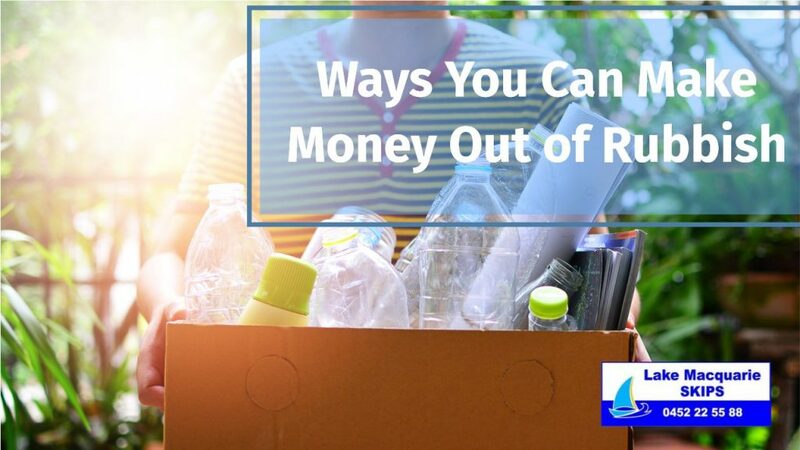 Here are five ways to make money out of your rubbish. After buying a new product, like a tablet or a new game console, your first instinct is probably to throw away the packaging. After all, what use do you have for an empty box and a bunch of foam? The same is true for DVD cases, toy boxes, and other containers. However, boxes and packaging material like carton, boards, foam and even bubble wrap, have a market waiting for resale. They have value to people who are looking for cheap but inventive ways to organise their items. You can also sell these products to people who are looking for materials for artworks and other projects. There are also some people who have the same game console as you, but who have lost their own original packaging. Most of these potential buyers are probably looking for authentic packaging to increase resale price of their own gadgets. Even original shopping bags and tags from premium brands can be resold in bulk or in piece. Things you carelessly throw away during the week can have more value than you think. Do-it-yourself artists and wood carvers, among others, would appreciate some of the material you have lying around the house. Empty toilet paper rolls and egg cartons are popular art materials, from schools to individual artists. They are best collected over time and sold in bulk. Wood carvers, sculptors and furniture makers are a potential market for scraps of wood and debris from your latest landscaping effort or renovation project. Even the remains of broken furniture, tables or chairs can be sold to the right buyer. Containers like glass and plastic bottles, jars, and cans can fetch a high price. Even empty make-up pans and palettes can be reused. Though you may not have need of them because the candle has all burnt out, or the jar has been emptied, other people can still make a profit out of them. That’s your market. Individuals and buyers in your local network might find these containers attractive for organisation and storage. Sellers of home-grown jam, preserves and waxes might also want these as packaging for their own products. You might not use your old Monopoly board, college textbooks, or PlayStation game, but they might just be the missing piece for a collector, gamer, or college student. These products still have utility, even if they aren’t the latest releases in the market. They can still be played or used by other people. Even if they have missing pieces or are not in pristine condition in some way, they might still be a perfect match to a prospective buyer. Throwing away old furniture thoughtlessly is a big missed opportunity. Even if a spring is broken or the leather’s all peeled off, there’s a high chance that someone else can still make use of that couch. For some people, repairing and redressing old furniture is cheaper (and often more stylish) than buying pieces that are entirely new. You never know if your outdated clock is actually a priceless antique. By recycling, reusing, and earning from your rubbish, you can stretch the utility of your old stuff. Even if you don’t make a huge fortune from these sales (and let’s face it, you won’t), you are also saving on the cost of general waste disposal. With less trash to actually send to the waste disposal site, you have less rubbish to fill the skip bin. You can save money by hiring a smaller skip bin or by getting less frequent skip bin hire pick-ups. Lake Macquarie Skips can be your partner in disposing trash and saving money. With competitive prices, a big range of skip bins, and a trusted professional team, you only stand to gain. Contact Lake Macquarie Skips through their convenient online booking system or through 0452 22 55 88!